Jimmy Iovine’s music subscription service Beats Music is launching on January 21, according to the New York Times. The service shared a few details about the service with the paper Saturday, including one small screenshot of its mobile app and some details around its pricing. It’s a start — but there is more to it. I have been able to obtain some key art as well as other details that give us a good idea of what Beats will look like, and how much it will cost. The screenshot I obtained seems to be of promotional nature, and shows Beats on an iPhone (S AAPL) and an Android (S GOOG) phone, as well as a browser-based version running on a Mac. It’s possible that it pictures an earlier version of the service, but given the quickly approaching launch date, it’s likely that this is close to the actual product. 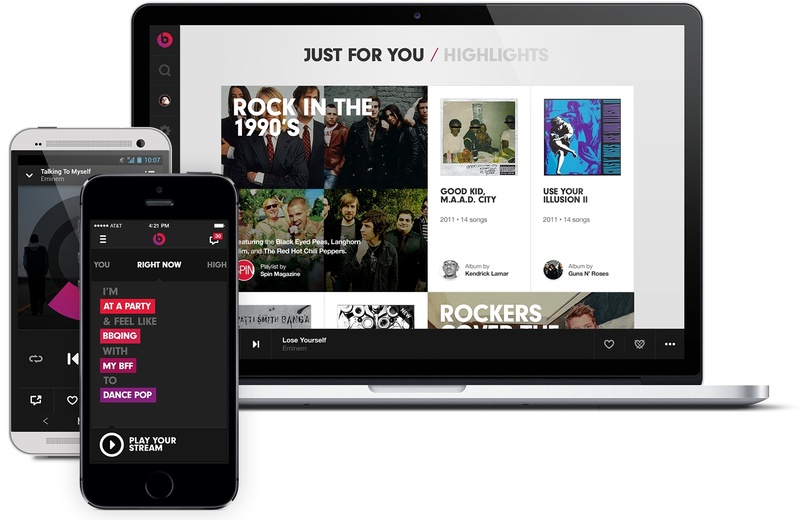 The Just For You / Highlights section displayed on the web app seems to be where Beats displays personal recommendations, including albums as well as playlists compiled by its freelancers as well as more popular curators. I have heard that Beats is cooperating with a number of brands for branded playlists, and judging by the screenshot, Spin Magazine is one of those brands. The service puts a big emphasis on human curation as opposed to automated content recommendations, and a previous leak indicated that a lot of these playlists were structured around activities, like BBQing and working out. The Times story also gave us some details around the price of Beats, saying that it will cost $10 per month. Here’s what else I have learned: As previously reported by the New York Post, Beats won’t offer a free, ad-supported tier. Instead, it will give users a seven day free trial. After that, Beats will cost $10 per month or $100 for a whole year. Unlike some of its competition, Beats also isn’t offering any kind of desktop-only $5 per month plan. I have heard that this is because Beats Music’s mobile apps are being considered such an integral part of the service. And here’s one more thing: AT&T users apparently get up to three months of free access to the service, and according to the Times, it offers a $15 family plan after that. Gigaom previously confirmed that AT&T is Beats Music’s carrier partner at launch. This story was updated at 12:23pm. An earlier version of this story incorrectly stated that Beats Music would launch on January 20. I gave it a try yesterday, and in four hours, I don’t think I recognized a single song. That’s pretty bad curating if your ask me. I know Beat Music just launched, but its sentence-based selections left a lot to be desired too. They were pretty limited, including the style of music I wanted to hear. For example, when I tried “reading on the couch by myself,” not a single music selection offered was instrumental, and few were anywhere close to relaxing. I changed that to “studying” instead, and I was presented with the same choices. Maybe they will get better over time, but at this point, Beat Music just isn’t worth the price. Beats Music, that is. I can’t seem to edit my post. If this does not have a native desktop app it’s a non-starter for me. Playing through the browser is horrible. Sounds like more of the sameâ€¦â€¦ While its nice to see an â€œattemptâ€ its still not much different than Spotify or Pandora. At least companies like, Funn Networks, who is supposedly close to launching, posts on their Twitter and Facebook pages what they are going to pay out to everyone while promising chnage for everyone.. And early reports are the royalties are 10-20 times more than Spotify on a per user basis. And yes, for all majors and indies.. Same pay outs.. Bottom line is thisâ€“ until somebody actually gives content owners what they want, they (content owners) will only have one leg over the fence.. And until somebody actually gives consumers complete control, they too, will only have one leg over the fence..
Dude..Janko..its an HTC One ..Come on. Also I could just add that ‘Beats’ was* apart of HTC etc etc the HTC one has the beat sounding speaker due date etc etc its a excellently build phone.